When I interviewed Narendra Modi in early March 2012, what impressed me the most was that he was obsessed with power – as in, electricity. Many Indian friends and observers had prepared me for Modi’s political ambitions – that he would soon put himself forward as the BJP’s candidate for prime minister. At the time, he was still chief minister of Gujarat, yet Modi’s obsessions were focused on a far more mundane form of power, but ultimately one that may be more important to India. He was impressively focused on how to bring electricity to people in his state. He proudly claimed: “Every village in Gujarat has 24/7/365 three-phase power.” He also spoke fluently about solar panels and water turbines, and about his ambitions on fighting climate change. If only the rest of India were so obsessed. Five months later – on the last day of July in 2012, almost two years ago exactly – India lost power across its troubled heartland, stretching from its far eastern border with Burma to its northwest border with Pakistan. Over 600 million people were estimated to have experienced the blackout— about half of all India, affecting more people than live in all of Europe, and about twice the population of the United States. That also is nearly one in ten people on the planet. 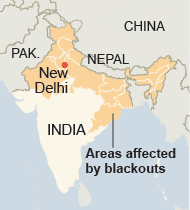 Out of India’s 28 states, the blackout covered 19 plus the National Capital Territory of Delhi. Three interstate grids had failed: the northern, northeastern, and eastern. Two-thirds of those affected lived in four places: the National Capital Territory of Delhi, Uttar Pradesh, Bihar, and West Bengal. That stretch did not include Gujarat, nor much of India’s south. The blackout shut down factories and office buildings, traffic lights and trains. Yet what might be more alarming is how much of the region was able to function without public electricity. To begin with, a great number of Indians have no public electricity. For those who do, power shortages and blackouts are so common across the region that many barely noticed. Many already rely on diesel generators—especially airports, hospitals, and many factories that demand continuous power to remain operational. Some version of this story happens daily across most of India. Regardless of income or status, power in many neighborhoods only runs at certain times. Those who can afford a private generator then simply flip a switch. Tamil Nadu is much better than most states. India’s southernmost state was spared the July 31 blackout because it maintains its own power grid. The same is true of Andhra Pradesh and Maharashtra, which provide electricity to 100 percent and 88 percent of their villages, respectively – though localized blackouts are common. In fact, there is only one state in India that is significantly better than those three, where there are no blackouts and 100 percent electrification: Gujarat. There, Narendra Modi successfully tackled energy reform. Modi’s secret? He made people actually pay for their power. It sounds quite simple, but in Indian politics and government, nothing has been more difficult. During years of socialist rule, India established a range of subsidies and discounts that provided low-cost or free electricity to its enormous rural and poor populations. As a result, a huge number of Indians claim to be rural and poor even if they are neither. Most Indians do not directly pay anywhere near the full cost of electricity. Much of the blame falls on state governments. Almost 40 percent of all electricity-generating capacity is owned or controlled by state electricity boards, and they are particularly prone to interfering with utility companies trying to establish a real market for electricity. The central government controls about 30 percent, and the rest is supplied by private enterprise. Those figures do not count the enormous number of backup diesel-powered generators that whoosh into action when the power invariably fails. Most state electricity boards can’t acquire adequate fuel or fully operate power plants because they either set prices too low, or fail to collect fees, or both. Together with the central governments, the state electricity boards also help build and maintain transmission lines—or not maintain them. Even in “normal” times, 25 percent of power generated is lost in transmission, thanks to a combination of aging infrastructure and outright theft. India probably needs to invest more than $2 trillion in transmission upgrades alone. And there is the fact that some states still have relatively low rates of village electrification. But the money currently collected from end users is insufficient to cover the unit costs of electricity, let alone new capital investment. So any money spent on fuel and transmission comes directly from general state and national coffers. That drains resources that could go to schools, roads, or other public investments for which it is even more difficult to collect revenues. In 2004, under Modi, Gujarat did what no other Indian state had fully done. It sent officials door to door to see who was poor and who was not. The inspectors started in the countryside, determining who was using power for farming and who was using it for household or industrial purposes. State authorities proceeded in a straightforward and disciplined manner. Moreover, the state also separated transmission—including collection of fees—from production of power. Those two steps allowed for the state-managed transmission company to effectively charge and collect fees. It also allowed private power companies to charge and collect a fair price for the energy that they were supplying to the grid. Gujarat’s farmers were willing to pay as soon as they realized that power would be more reliable. “Once farmers had power, they wanted to buy electric appliances,” then-Chief Minister Modi explained to me when I interviewed him in 2012. “Now we have high-quality power all day, every day, in every village. Andhra Pradesh, Tamil Nadu, and Maharashtra are trying to follow suit. Each has learned that getting prices right on electricity is critical to its industrial future. In the last ten years, each raised electricity prices, despite political opposition. Chandrababu Naidu did it in Andhra Pradesh in 2000, which helped contribute to his defeat. Jayalalithaa did it in Tamil Nadu in 2012 and seems to be surviving. These states also have tried to cut down on energy theft and false claims of rural poverty, and as a result, they now provide electricity to 90 percent or more of their populations. Each provides more power each day than in previous years. But until prices are fully right in those places, power will fail and diesel generators will need to swoosh into action. Aside from power shortages, the chronic underinvestment in electric power infrastructure in India has generated an additional side effect: an overinvestment in diesel fuel. Diesel generators are far less efficient per unit of energy than a coal-fired power plant, and they also contribute significantly to local air pollution. Although diesel fuel receives some subsidies, prices are beginning to reflect the true costs of a relatively open market, now incorporating basic costs of importing, refining, and delivering the fuel to customers. While it is more expensive, it is still worth buying when the lights go out. As I wrote a few weeks ago, energy reform under a Modi government will require streamlining government agencies and modernizing the electricity grid – at least at the central level. In his first month in office, there has already been a consolidation of energy-related ministries. But the real battle for power – that is, high-quality, reliable electricity – resides in the states. Each state will need to improve service delivery and build capacity for price reform and fee collection, as Gujarat did under Modi. They will also need to invest in renewables – which can be cost-effective in a country with so many average days of sun each year – and in energy efficiency. All of that starts by getting the prices right.